Of course its a nice idea to grow your own live food for your aquarium system in your home. Its difficult though not to make it into a real chore and spend more time culturing than enjoying the aquarium. Thought its about time to post something about my food cultures as they take up so much (but also less and less as I get to grips with it) of my spare time and there is now success in all three cultures. From what I have found on my google researches the phytoplankton is a tiny photosynthetic organism that is the bottom of the food chain in a marine system, everything depends on it, without it the seas would probably be very dead. Its vital too keep the microorganism in the aquarium sand alive by feeding it as its my main filter. Also all the microfauna like zooplankton etc or featherworms but of course also all other filter feeders like clams, mussels, oysters, hydroids, bryozooans etc. rely on it. Its basically a tiny plant thriving on sunlight and producing fatty acids and glucose that are the base of the food chain. There is a good link here explaining this in better detail and also the pros and cons of dosing it to an aquarium. Its fairly deer to buy and hard to get locally where I am based so I looked into growing it myself as it seems to be extremely easy to do. I wont go into too much detail here as other people have done that perfectly for example here. 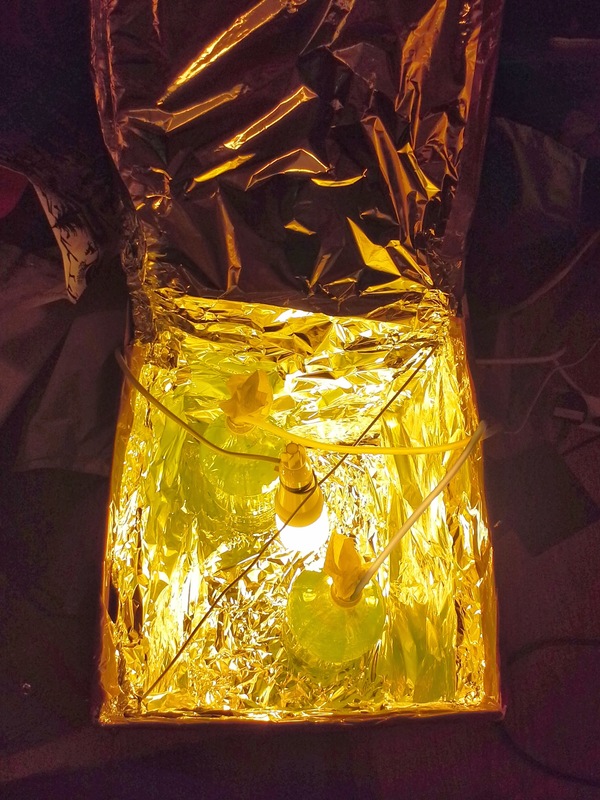 Basically all I used is: Cardboard box, tinfoil, 20W lightbulb, airpump, airstone, 2l Pet bottle, MiracleGrow All purpose Plantfertiliser, Phytoplankton to start culture. In a nutshell what I did then is lined a cardboard box and lid with tinfoil, cleaned two 2l bottles, filled with seawater (from tank), added little bit of Phyto (bought in store) so that the water has just a bit of a green shimmer, added 5ml of Miracle Grow to each bottle, dropped airstone into them, “sealed” top with a bit of kitchen towel, put the bottles in my “reaktor” (tinfoil lined box), switched Lights on a 16hON/8hOFF cycle. Happy days, I poured half of each into another bottle that I keep in the fridge for feeding, the other two bottles topped up with tank water and back into the reactor. I am feeding it now to the tank every second day and to the copepods and mysis shrimp cultures (see next Post). 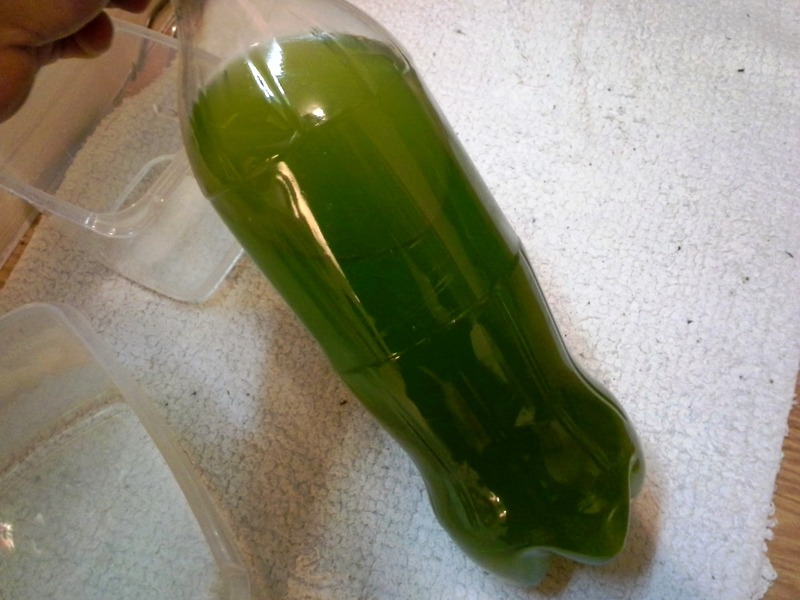 I have to be careful, adding too much to the tank can crash the system very quickly as there is lots of nutrients in it. Testing water regularly. The phyto cultures themselves will apparently crash eventually and I will have to restart but I want to see how long it lasts. Keep in mind for a better result, absolutely pure, home mixed saltwater is being advised to be used and sterilizing bottles and any equipment used between runs. I am not doing this and I am using tank water which is far from pure but will see how long the culture lasts.